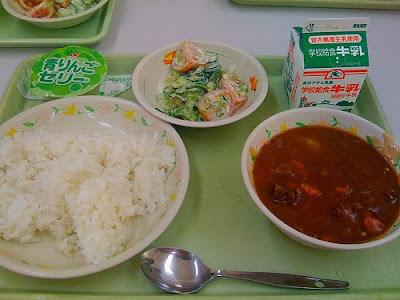 Contents: Rice, soup, salad, milk, *apple jelly. The green cup is apple jelly. Very yummy. Usually only served once a month as a treat. And if I am not mistaken that is a curry, not a soup. Yes that's curry, served with the rice.